When I bring up the idea of technological unemployment (which I obviously do a lot), it strikes me that people suddenly seem ready to admit that it really could constitute a systematic threat to our modern way of life. But even in the same breath as admitting to the imminence of change, people inevitably fall back on the idea that they are somehow going to escape the effects of it. In response to this, I want to say this in no uncertain terms: If you think you are going to be able to keep up with the future, then you aren’t paying attention. Below are a few examples of the kinds of arguments that people make when in discussion about the future, as well as some of my responses to these arguments. Some are new, and some are based on previous articles I have written over this first year of Thought Infections. Retail is probably the sector most obviously threatened by the move to an online sales model. The market share of online retail grows every year, now representing somewhere in the range of 8-10% of overall retail sales in the United States. 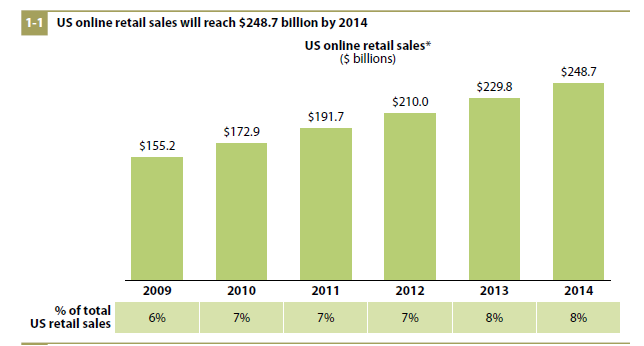 I would not be surprised if online retail accounts for more than 50% of total sales within the next decade. Of course, retailers will need to employ many people to market, sell and deliver goods whether online or off, but online retailers can do it much more efficiently. For a real world example we can look at Amazon and Target, two companies which have quite similar overall revenue but whereas Target employs some 361 000 people, Amazon employs less than a third of this number at around 110 000. With their purchase of the robotic warehousing systems manufacturer, Kiva Systems, Amazon has made it clear they are looking to increase their overall efficiency by aggressively automating their warehouse operations. Amazon has also recently announced that they are researching the use of delivery drones to provide high speed delivery of goods right to your door. While I see this as more of a PR stunt, the rapid development of automated vehicles is sure to have a huge impact on overall employment in transportation and delivery over the next decade. The jobs are never coming back, it is time that we start to deal with that reality. Education is currently undergoing a revolution, as technology is making it easier to educate children at home. I can’t say it any better than CGP Grey in his excellent youtube video about the emergence of a digital Aritstotle, so just go watch the video now. Suffice it to say that it is very difficult to compete with science. Even disregarding the likelihood of advanced artificial intelligence coming online to aid in this endeavour, the development of even simple algorithms to deliver lessons and monitor the development of each student directly is nothing less than a revolution. For another example of just effective computerized learning tools can be, check out the language learning website Duolingo. I can personally attest that Duolingo is an extremely effective tool for learning at least the basics of a language. Is it better than a class with a top notch language teacher? No. But is it better than a crappy language teacher? Absolutely, and it is only getting better. Will there be teachers in the future? Absolutely. But, I am confident that technologies like that being developed by the Khan Academy are opening the door to a new type of learning that will be more efficient, cheaper, and involve radically less human labour than the rote system of learning currently being practised across much of the world. While I am generally bullish on the creative arts as a human career path for the medium term, I do not think that they will be able to outrun the onslaught of automation forever. For many years computer scientists have sought to be able to simulate and/or replicate the creative process using computer algorithms. There are actually many programs which have been developed to produce both visual art and music. Computers are also making amazing progress in the generation of written word. The company Narrative Science has developed algorithms capable of taking complex data and turning it into a written narrative which most people can understand. Here is an example of the kinds of articles that this program is already writing. Other algorithms have even made attempts at creative writing, with some success. These forays into the creative world may seem rudimentary now, but I think they serve as proof of concept and given the exponential nature of computer advancement I think we will likely see a time when computational creativity will match our biological ones. In our lifetime, I believe it will be possible for a computer to write, develop, and create an entire movie which is customized in content and style to your particular preferences in real time. Given the access that these algorithms will have to the wealth of data about their audience (namely you), I am not sure how it is it that a human artist will be able to compete. Being a scientist myself, being aware of my own limitations and deficiencies I actually think that people make pretty lousy scientists (see my series the Confessions of a Biological Scientist). We strive for a goal of beautiful impartiality but inevitably fail miserably. The next generation of algorithmic scientists will make today’s scientists look like nothing more than children in a sandbox, and it’s already started. The march of progress in robotic science will also spell the end for the people who work in those related fields where we also strive for impartiality, such as medicine. The irony that I see, is that it may very well be those researchers working on the cutting edge who are rapidly replaced by robotic scientists before we see the eradication of menial labor jobs. We may simply end up the janitors to the machines, sweeping up around the silicon minds that replace the meat-based scientists of today. Wealth has never made people anything much more then well-dressed, why do we think that would change now? Despite the poignant debate surrounding the growing gap between rich and poor, it is important to keep in mind that tectonic technological change has consistently made a mockery of the power structures that predate it. For an example of this, try visiting a grand palace of the monarchs of even the 19th century. Of course you will see the ornate decorative splendor of great wealth, but look a bit closer and you will see that they slept in a small bed, no electricity, no running water, slow transportation, and information came in at but a trickle. We also live in a world where the idea of wealth itself is changing. Bitcoin and other cryptocurrencies represents a whole new form of wealth, and may ultimately mean the waning of fiat currency which has dominated the modern world. Other asset classes that people use to hold wealth, such as real-estate or commodities like gold, could easily also see a depression with the rise of cryptocurrencies. Ultimately, Bitcoin may or may not turn out to be the spark that ignites a revolution in the financial world, but what it should prove to us is that such a spark can exist. In time, the current paradigm of world power (like all that preceded it) will be turned upside down. There is some merit in the argument that being aware of the future makes one prepared for it. But if we accelerate towards some grand explosion of artificial intelligence, as some have predicted, I don’t think that anyone can really be ready for what is going to happen. You can have the future, but you can take nothing with you. My intent here is to remind you that we all live in a changing world from which none of us can escape. Even death might be only a temporary escape in a future which eats our digital crumbs and spits out minds. Yes it seems that we are utterly trapped by progress, but we do not need to surrender to it; we must push to reshape the world for the better. Mark Twain once said that history does not repeat itself, but it does rhyme. We must strive to express our humanity in the systems we build, if we wish to see a humane future. If we give over to our lesser angels of greed and violence, we will see a future dominated by these traits. Technology is fundamentally amoral, it will serve to magnify our successes and our sins, it is up to us to choose which ones. I think it’s wrong to tell people how to live their lives. Beyond what is necessary to ensure the safety and security of those within a society, the state should not impinge on the liberty of individuals to live their lives as they see fit. There may have been a time when the need for social cohesiveness in a brutish world trumped the rights of the individual, a time when moralistic laws against certain lifestyles were justified, but that time is behind us. Although the tension between social cohesiveness and individual freedoms is eternal and inescapable, I always find it encouraging that the ethic of the modern world seems to have slid so consistently towards liberty; advancing in the intensive bursts of societal change seen during the enlightenment, the American Revolution, and the civil rights movement, among others. More recently, we have seen momentous shifts in the ethics of female empowerment and sexual freedoms. While societal progress often seems a frustratingly slow process, the past has shown us that change can crystallize around a strong moral argument. An idea who’s time has come can transition from ridiculous to obvious with surprising quickness. I think we might be currently standing on the doorstep of a great new revolution in personal freedom; one in which will reexamine our ethic of work. I have already written extensively about the problems inherent in a highly automated society which also relies on the “job” for as a means of providing basic sustenance for people. The plain fact of technological job displacement provides ample argument that basic income will be a pragmatic necessity to avoid mass poverty following mass automation, but here I would like to make an argument that is equally important as such practical considerations. Freedom in the 21st century should mean freedom from having to engage in productive work simply to meet your basic needs for comfort and dignity. At one time, the ready availability of jobs amply filled the need for a basic access to a comfortable and dignified life, but precipitous technological and economic changes erode this dynamic further each day. The function of the economy has never been to provide gainful employment to people, but simply to provide material goods. As the economy manages to produce more with less human labor, we must create new mechanisms aimed specifically that maintaining and raising the minimum level of comfort and dignity to everyone in a society. The first step, as for any change, will be to admit that we were wrong. The establishment of a basic income will require every inch of personal and societal soul searching we went through in previous epochs of tectonic social change. Social progress has too often been retarded by our inability to deal with our own fallibility. The abolishment of slavery and the establishment of civil rights was an agonizingly slow process because those in power were unwilling to deal with their own sins. Similarly, even as wealthy years of technological and productivity gains have eroded the justification for the job-driven society, we remain unwilling to admit that we were wrong; it is ok that we let people starve because we have no choice, right? We maintain a facade of work ethic aimed at convincing ourselves that our draconian social constructions to compel people into productive work are necessary and morally just. If we test this facade of work ethic, we can easily see that there is little real rationale for maintaining our current view of work. We can afford to have everything that the dramatically less productive economies of the 50’s, 60’s, and 70’s had; things like healthcare and education are not too expensive, and it is not acceptable to let people whither in poverty. Worse than just being immoral, the desperate poverty of the lower classes is both immoral and useless. It is not a lack of money that compels the great successes of the modern age, but rather the availability of opportunities. It is because healthy, well-fed people were able to get a good education that allowed us to realize the great miracles of the modern age (eg, the internet, smart phones, Google, etc…). We must rebalance the right of society to compel people into productive work with the obligation of society to support its citizens. It should be noted that basic income is not aimed at the unrealisitic and undesirable goal of unfettered access for all to every luxury of the world. Freedom from work does not mean the right to luxury; it simply sets a baseline below which no person should fall. Basic income seeks to strike a fair balance between allowing the benefit of work to coexist with a system aimed at delivering dignity and opportunity for all in a society. Beyond just better enabling access to opportunities, basic income will also allow people the freedom to live as they choose; to explore unpaid work in the form of volunteering, participating in creative projects, or starting new business ventures. Some argue that there would be less incentive for people to start businesses and be productive, but it could just as easily be argued that it would remove the disincentive from the high-risk, high-reward ventures that are so valuable to modern society. One exciting example might be the number of small startup companies which could be realized if people had the time and support to work on their interests without worrying about their basic needs or being accountable to investors. In my opinion, basic income opens much more opportunity in this way than what it closes by disincentivizing work. It would also provide a firmer platform for those bargaining with employers looking to fill unfulfilling, dangerous or otherwise undesirable jobs. Requiring people to live so much of their life working simply to earn a basic income is a waste of human potential and bad for progress. By eliminating the obligation to work just for simple survival, basic income would allow a new dynamic expansion of human freedom and human potential. A society compelled to perfect cohesion and homogeneity lacks the dynamism to compete in the modern world. New ideas can only come into being at the chaotic interface between contrasting worldviews and lifestyles. In a world where progress is completely reliant on our ability to innovate and create new ideas, we should be seeking to maximize the spectrum of lifestyles which can be expressed within the society. By removing the need to work just to live, we will let people explore their true potential, and we will realize the untold benefits of a new dynamism. And this brings us to the real reason that I think basic income will happen soon, not only because it is morally the right thing to do (which it is), but because it makes good sense economically. Just as slavery ended when factories made the economic model of slavery obsolete, we will move towards basic income because it makes good economic sense for the modern innovation economy. Dynamic, creative and competitive economies of today must seek to stretch the social fabric to its limits. Basic income will serve to reinforce this fabric and enable the risky ventures that will power us forward in the 21st century. If you are interested in learning more about basic income, here is a link to the wikipedia article on the subject, or you can head over to http://www.reddit.com/r/BasicIncome for some more in depth discussion about why and how we could really make basic income happen. I am old enough to remember a time when there was a differentiation between a video card and a 3D graphics card – that’s right you whipper snappers, there was a time when specialized hardware had to be purchased to either feed information to a monitor that looked something like this OR perform the calculations necessary for 3D gaming that looked something like this. (1) Playstation 1 – released 1994 – The dualshock controller marked a breakthrough for 3D gaming, allowing the ability to simultaneously control movement of a character and the where that character is looking. 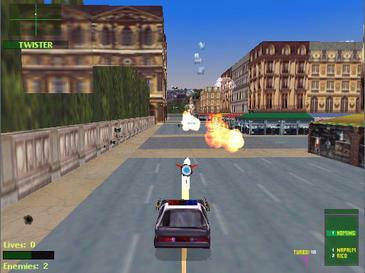 The graphical advancements over the course of the PS1 lifetime were consistent but modest. (2) Playstation 2 – released 2000 – The release of the PS2 was the beginning of what I think of as the age of accelerated gains in graphical wow factor. The release games with the PS2 were really only an iteration above the best games on the PS1, but this changed greatly over the lifetime of the system. The jump to Grand Theft Auto III level graphics was nothing less than a revelation at the time, it was like nothing we had ever seen before. (3) Playstation 3 – released in US 2007 – By the end of the era of the PS2 games were actually becoming pretty hardware limited (although games continued to be released for PS2 for many years after the release of PS3). The release of the playstation 3 marked a significant graphical advance. Over the course of the system’s lifetime (which is not yet even over), there were still consistent gains in graphical quality but nowhere near what we saw on the PS2. (4) Playstation 4 – Released 2013 – Just recently released, it is yet to be seen how far the PS4 will push graphical advancements. Launch games do look quite nice as shown below. So what is the point in all of this? Well first I just wanted to illustrate just how impressively far we have come in just 20 years. Since 1994, we have gone from a basic 3D with buildings which are rendered as simple boxes with some crude textures on them, to the much more realistic landscapes of modern games such as GTA V or NFS Rivals. 3D gaming serves as a perfect example of the kinds of breathtaking changes we have and will continue to see across the tech world. Still, there is something more here. Notice the rapid improvements that were realized between 1999 and 2006. Now compare that to the difference between 2006 and 2013. Despite being a longer time, there just does not seem to be the same kind of leaps and bounds advancement we saw earlier. Yes, the games have undoubtedly improved, with more details, more believeable character modeling, better physics, but overall the improvements have not been a large as they were earlier. By way of another example. Here are three FPS games which really pushed the graphical boundaries with their respective releases as they came out at about equal intervals. 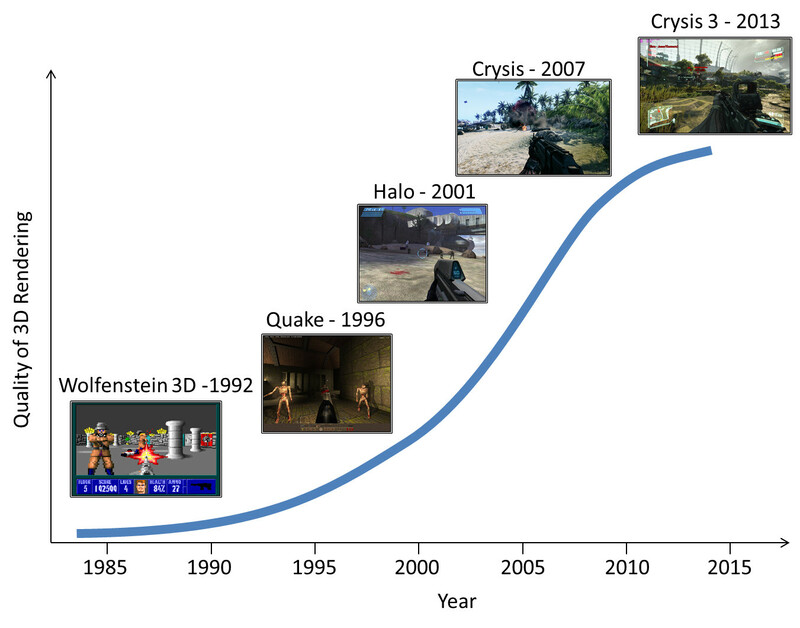 There is approximately the same time gap between the release of Halo and Crysis, and between Crysis and Crysis 3. 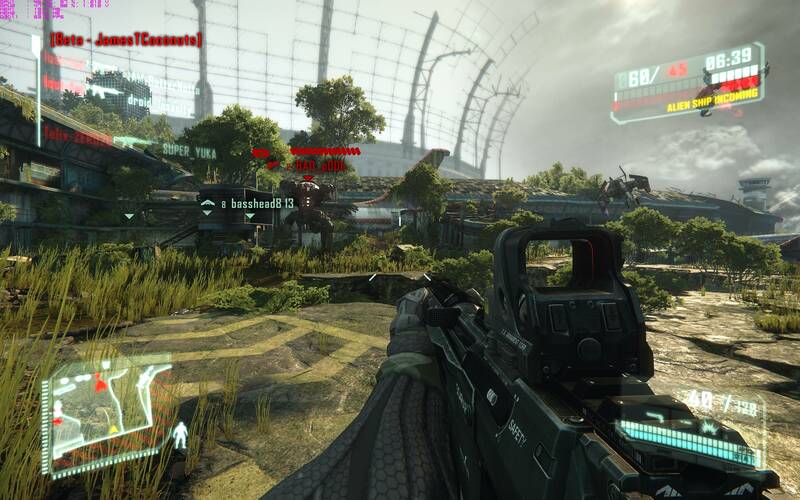 Certainly there is an obvious improvement across all 3 screenshots, but in my opinion the difference between Halo and Crysis is far more apparent than the difference between Crysis and Crysis 3. So it would seem that 3D games, while still consistently showing improvement year over year, subjectively they seem to be improving at a slower rate than they were previously. If I were to plot a graph based completely on my subjective asessment of the quality of 3D rendering of games it would likely look something like this. The shape of the curve above is what is known as a sigmoidal curve (as in shaped sort of like an S). Often times what appears to be an exponential relationship is actually the beginning of a sigmoidal curve. In the case of games, of course they continue to improve today but the overall rate of change between successive releases has begun to slow. While I don’t predict video games are going to stop improving altogether, I simply think we have entered an age of diminishing returns in terms of the quality of 3D. This means that as we put in about the same amount of effort in improving video hardware each year, we don’t get quite as much subjective improvement in the overall visual result. The reason that the quality of 3D games is not improving at the startling rates that it once did is likely related to a number of factors, but I think one of the simplest explanations is the diminishing visual improvement from logarithmic increases in the number of triangles used to render a particular scene. In the early days, when games when from thousands to millions of triangles to render a particular scene, the difference was astounding. We ended up with something on the order of the improvement we saw between Twisted Metal and GTA III, and it was breathtaking (bordering on unbelievable) to see at the time. Games just kept getting better and better. Surely this would go on forever. But if you look at the difference between 6000 and 60000 triangles in the image above you can see what the problem is. Even if you go through a completely new hardware iteration and manage to improve the rendering by a factor of 10, subjectively the experience does not improve that much. At this point you have reached an era where even exponential growth in the power of hardware starts to result in diminishing returns. There have been a number of responses to the argument that increasing numbers of triangles for rendering really should provide more details in models (as here) but I think the fact still seems to stand, we are past the inflection point in the ability to render convincing 3D scenes. Will we see major improvements in video games in the future? Yes, without a doubt. Will the improvement in raw 3D rendering ever be as astounding as the kind of jump between 2000 and 2010? Not likely. So what can this tell us about technological change more generally? Do we see this kind of sigmoidal curve in other technologies? Absolutely. I would say that the improvement of operating perspectives from the perspective of usability and productivity would be another good case. DOS was a wicked operating system, compared to it’s predecessors. Similarly first release of Windows was an absolute revelation in terms of computer usability. Successive generations of windows got better and better, with 95 and eventually XP offering exponential improvements. But really, since XP, changes have been more either in the background, or iterative tweaks to the general user interface. The advance of operating system usability is well into the age of diminishing returns. How about something more hardware related? Well if you look at the history of digital storage (ie the SD card) it seems to have a similar trend. Using the Way Back Machine, I noticed that the maximum size of an SD card went from 1gb in 2004 to 8gb in 2007, by 2010 it was 64 gb, and now in 2013 it still is at 64gb. The 128gb SD card seems to be on the near horizon, but it has taken at least 3 years to double once. It would seem that flash memory has entered the age of diminishing returns, and in its current form it is unlikely to ever reach 1TB capacity. In the science lab we see sogmoidal curves all the time, in fact it is rare that we see any natural system where there would be a exponential relationship without some sort of sigmoidal nature. The interaction of antibodies with targets, the reaction of an enzyme with its target, the growth of bacteria – all are exponential phenomenons that eventually hit physical limits and enter a plateau phase. Those exponential relationships so adored by futurists are always just the beginning of sigmoidal ones. Diminishing returns are a fact of life, and we futurists are just going to have to deal with it. The advances of graphical wow factor are slowing down, improvements in SD capacity are diminishing, and eventually even Moore’s law will hit a fundamental barrier and we will see that what was exponential will become sigmoidal. Will new technology replace with new exponential curves eventually supplant the technologies driving Moore’s law? I hope so, but they too will eventually find their own limits. So is this all doom and gloom then? Will we never get to the exciting futures that we like to envision? I am still confident that we will because we have yet to hit one very important inflection point. By my subjective observations the returns that we have achieved from scientific investment continue to pay accelerating returns. We have yet to envision a limit to the exponential power of human ingenuity and I hope it stays that way. Hey fans of TI, I am looking for contributors and guest bloggers. 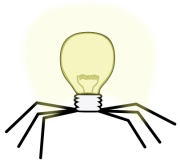 If you have an interest in futurism and you would like to try your hand at writing for a growing blog, send me an email at thought.infected@gmail.com. If you would like to support TI in other ways check out the new support page (go bitcoin! ).